This is the first in a trilogy of undead modules, as I like to think of them, the others being Erech and the Paths of the Dead and Dagorlad and the Dead Marshes. 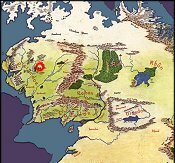 The Barrow Downs straddle Arthedain and Cardolan (though belong more to the latter), while the Paths of the Dead bridge Rohan and Gondor; and the Dead Marshes sit between Rhovanion and Mordor. 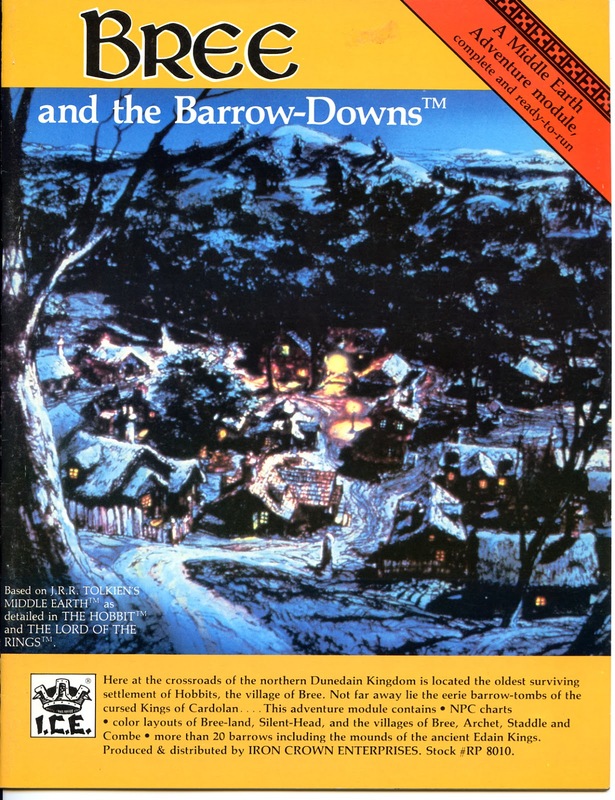 The neither-here-nor-there geography suits an undead theme rather nicely, and of the three modules this one is probably the most fearsome: the Barrow-Downs would slay beginners in an instant. Wights in MERP are more formidable than their D&D counterparts, their mere presence inflicting paralysis, their touch causing an eternal nightmarish sleep that can only be broken magically. The four hobbits wouldn't have stood a chance without Tom. There's something primal about Bree and the Barrow-Downs, and not just because it was ICE's first adventure-sized module. It sets a haunting stage: a crossroads village where men and hobbits co-exist, surrounded by ongoing tensions -- bandits on the roads and evil tombs off them. This breathes classic D&D in a way few modules get at so simply, and I'll bet that for many MERP gamers, Bree is among the first places they got started. I never got any use out of it, and I'm baffled as to why. It's aged tremendously well, and in my view holds the near equivalent status of TSR's Keep on the Borderlands, though again, not exactly tailored for low-level characters if the downs themselves are to be attempted. What really grabs me is the overshadowing power of the wights that goes beyond killing people who just happen to be stupid (or ignorant) enough to not stay away: "The wights are symbols that point to the waning of the Dunedain of the North since the coming of Angmar; men now lack the strength to keep their ancient graves free of unclean spirits." This is a recent phenomenon: only in 1638 were the wights sent from Angmar to animate Arnor's dead kings and princes and make the tombs their home for the rest of the Third Age. The module is set in the year 1700, making the undead presence a fresh wound, and thus primarily a killer of morale. Graphic brutality is fun -- and rituals by which the wights carry victims into the barrows and deck them with jewels in preparation for ugly sacrifice are described here -- but tone is just as important in RPGs, and Bree gets the tone perfect. There's a real feeling of foreboding evil that saturates Bree's atmosphere without going over the top. The mapwork is completely satisfactory. There are arial views for the villages of Bree, Staddle, Archet, and Combe. The Prancing Pony is notably absent, as it didn't exist yet in 1700. A layout of a typical hobbit-hole is provided, giving the feel of the mixed hobbit-mannish population. Drawings of the barrows display different kinds: First Age barrows, the royal barrows of Arnor's kings (from 1-861), and the barrows of Cardolan's kings and princes (861-1409). These tomb layouts are where the module delivers, no less than 24 of them by my count, each detailing the treasure contents of artifacts, magic items unheard of, powerful weapons, jewels, and antiquated coin. It's a Monty Haul feast for the eyes, but removing any of this stuff without being vilely cursed is the real trick. Actually, the Prancing Pony exists, but in the time period of the setting, it's called The King's Rest INN.